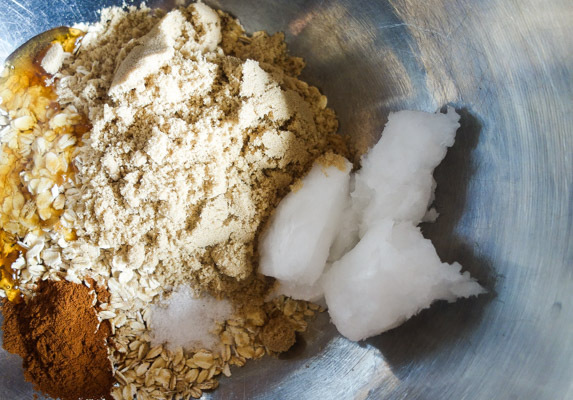 Begin by mixing raw oats, sugar, honey, salt, cinnamon, and coconut oil. Add in the boiling water and mix everything together again. I used a metal mixing bowl since you’re adding hot water, but a glass bowl works well also. Let it cool until it is lukewarm before moving on to the next step. Add the yeast and flours and knead the dough for 10 to 15 minutes. If you have a Kitchen Aid mixer, this step will be much easier for you. However, I don’t have one so I do it the old-fashioned way. 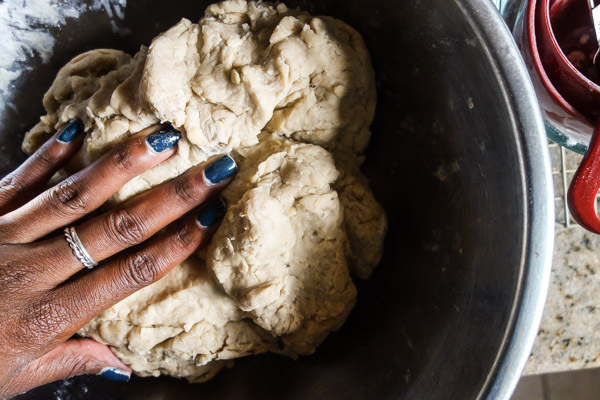 The dough should be fairly smooth by the time you’re done kneading. Cut the dough in half before letting it rise. I just did it right in the bowl, but you could lay it out of a lightly floured flat surface if you want perfectly even loaves. Lightly grease the bowl and let the dough rise. Make sure to cover it tightly with plastic wrap. 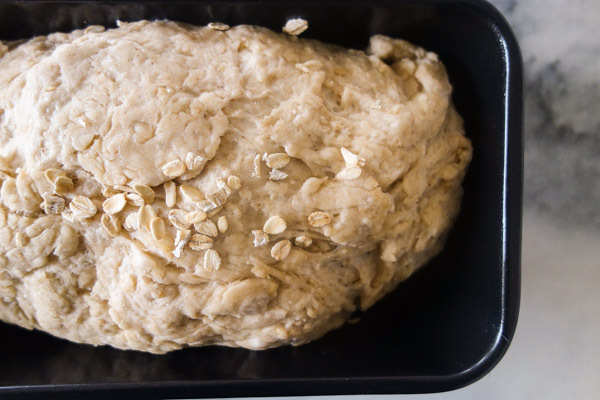 Place the halves of dough in a lightly greased loaf pan. I greased mine with coconut oil spray. Cover and let it rise again for about an hour or so. It will start to rise towards the top of the loaf pan, that’s how you’ll know it’s ready. 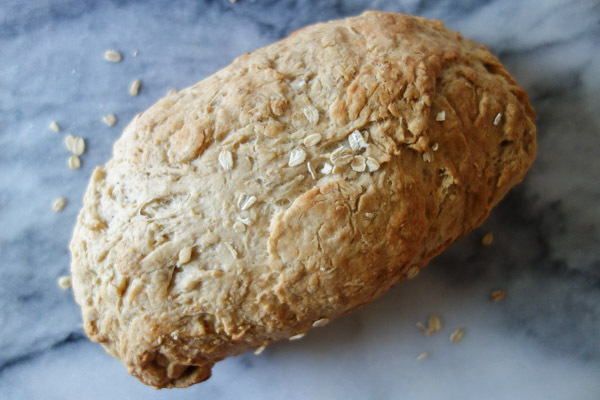 Bake the bread for around half an hour or until it is lightly browned. I sprinkle a few oats on the top before baking. Let it cool for a few minutes before you slice it up. 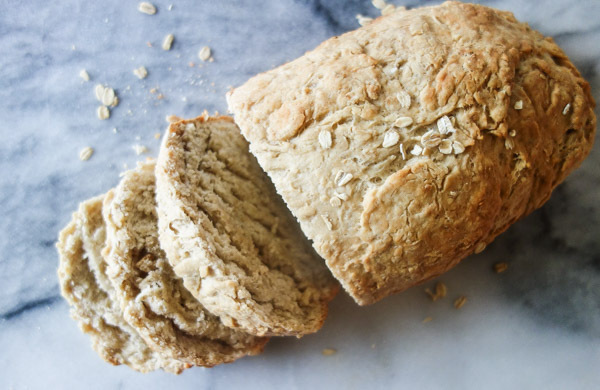 This makes perfect sandwich bread and it great with just a little butter. 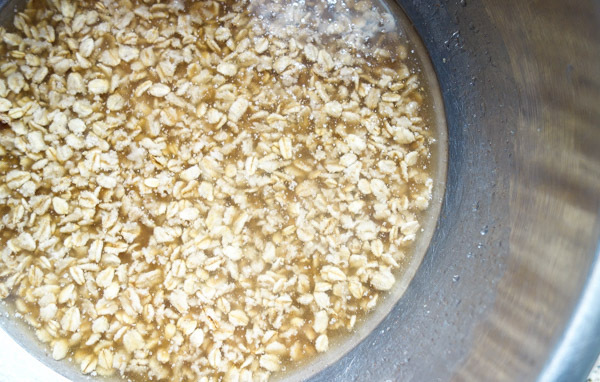 In a glass or metal mixing bowl, combine the water, oats, brown sugar, honey, coconut oil, salt, and cinnamon. Let cool to lukewarm, about 10 to 15 minutes. Add yeast and flour to make the dough. Knead for approximately 10 minutes until dough is smooth. Transfer the dough to a lightly greased bowl and cover with plastic wrap. Let rise for 1 hour. 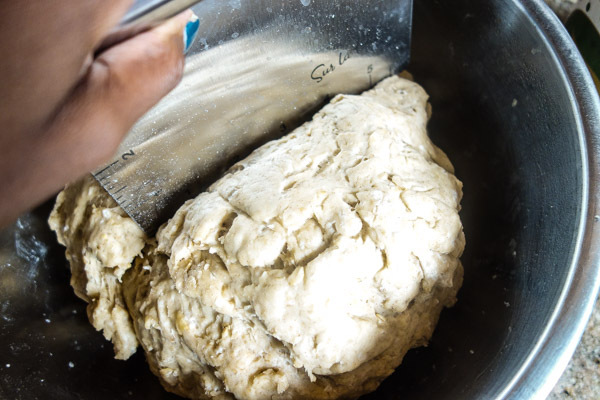 Divide the dough in half and shape into loaves. 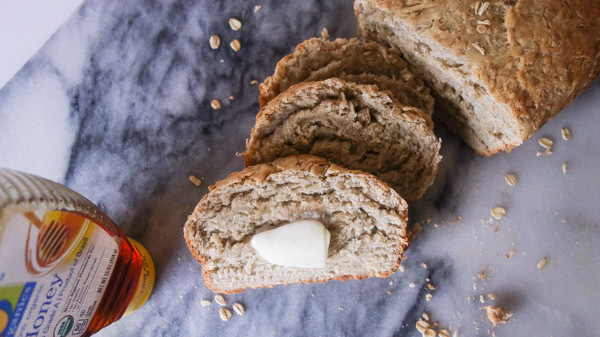 Place the loaves into loaf pans greased with coconut oil spray. Cover the pans with plastic wrap and allow the loaves to rise for an hour. Bake the loaves in a preheated 350°F oven for 35 to 40 minutes. Let loaves brown lightly, but cover with foil if they begin to brown too much. Store the bread wrapped tightly in plastic wrap. Recipe from Joy the Baker with slight modifications.